While at Chiricahua National Monument the sign said Camping Full as I entered the park. Shortly after fininding a place to park at the crowded visitors center I found myself in line at the visitors center desk fir information. I picked up hiking brochures that were out and the park's colored brochure that highlights the history and what there is to see. While waiting my turn the ranger took a call and told them that the camping was full. She went on to tell them that there was dispersed camping nearby. My turn came up and as usual others questions to the ranger answered my original question, but I decided to ask. "I heard you mention disbursed camping." She bends down and picks up the following 2-sided paper and hands it to me and I ask some questions about where it was. Most campers that have trailers, pick up campers, etc are self contained. People that tent are not. I made my Prius to be self contained for 3-5 days and longer if I plan correctly. Yes that is right I have the ability to carry waste, but I don't generally have to. 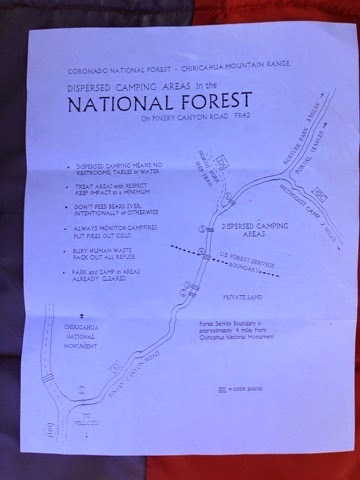 I have stayed on BLM land and most want you to remove your human waste, but on this document the Forest Service says you can dig a hole and put it in. I wanted to check out the area as since I was 1.5 hours from Tucson I could disperse camp for the night. I drove out of the park and turned left on a county road that is dirt. Eventually I got to a sign that said road not maintained by county. It looked recently graded so I continued to drive. Then it was washboard that wanted to shake my Prius apart. I kept one set of wheels in the gutter as there were no bumps there and went to a rattling crawl. I found the dispersed camping along the stream and it would be fine but no cell coverage again for blogging and it was raining a little. I don't have ground clearance on the Prius so I can't do wet washes and I left for Tucson. The key is that there are many people and families that may want to visit these places that I have been, and can't afford the costs of camping every night. Here now is an option at least out west here. The other day there was BLM land in Why, AZ next to Pipe Organ Cactus. This spot could also be used for a Kity Peak visit. Now on the eastern side we have National Forest Land that has dispersed camping. This location can also be used to visit Bisbee, AZ that I previously posted about. The lesson is that you need to ask if there is any federal dispersed camping land. 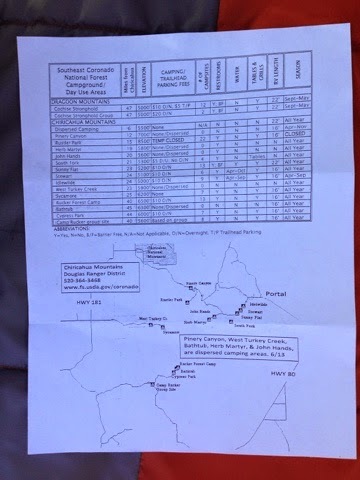 This land I was looking at to stay the night had the information on the web so a little internet work ahead of time can find these places and all you needed to do was know to ask the Rangers too. Don't forget to pick up your national park senior pass as if you go to a national park to camp you get 50% off the camping price and there is no entrance fee.